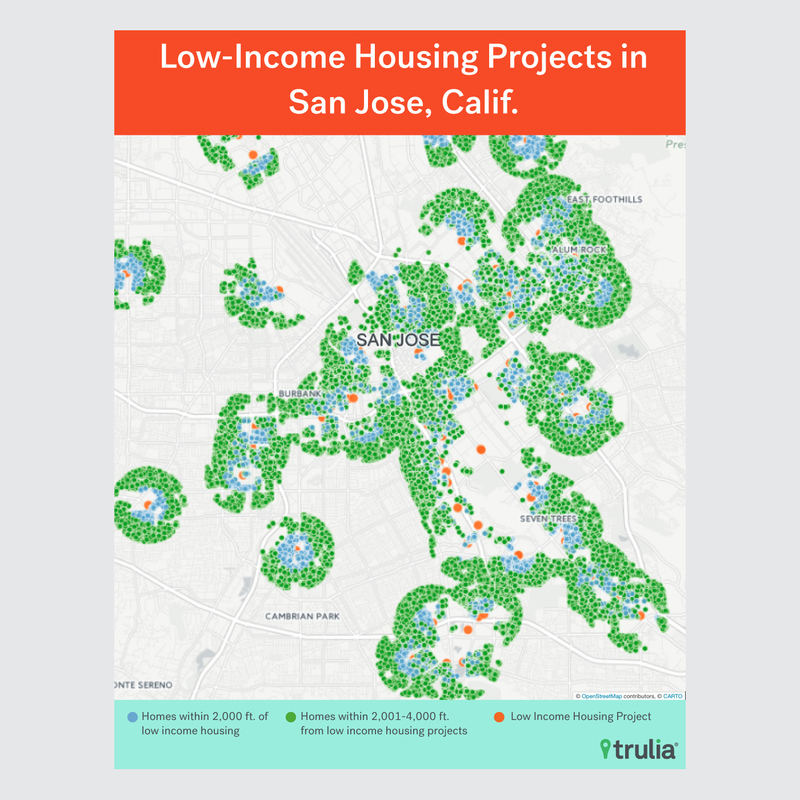 Trulia, the real-estate listings service, dug deep into its data to track home values in areas where low-income housing was built. Author Cheryl Young looked at 3,083 low-income housing projects built from 1996 to 2006 (prior to the price-distorting housing bubble beginning in 2007), in “the nation’s 20 least affordable markets.” With just a few exceptions, the low-income housing had no effect on house prices. There are some exceptions. In both Boston and Cambridge, Massachusetts, completed projects had a negative effect on prices, but in Denver house prices actually increased after a project was completed. Young posits that the building of several projects in one region might have crowded out other development in Boston and Cambridge, accounting for these drops. The prices were compared by taking the values of properties within a 2,000 foot circle of the low-income housing, and comparing them to similar nearby neighborhoods. Young also lists these 20 “least affordable” housing markets, along with the number of low-income housing projects built there. It’s easy to see that New York added the most projects—a massive 1,039 of them—in the measured decade, almost three times that of L.A., which is next in the listings. But New York is big, so it makes more sense to measure by number of low-income housing units per 1,000 population. In this view, San Jose leads the pack with 7.81 units per 1,000 people, and Oakland comes last, with just 0.52 units. These figures might prove useful in future, as cities look to build new low-income housing and neighbors try to use a financial argument to object. Numbers like this will prove a great tool to combat the fear that new projects will depress the values of existing residents’ homes, although surely the worst of these folks will find a new reason to mask their distaste for people less well off than them.